to Lord Ganesa for a meaningful life and right guidance. curved mouth, single tusk, black eyes, elephant face, big stomach, giant structure, savior of all, grey colored, moon like forehead, protector, ganapati, and Gajanana. 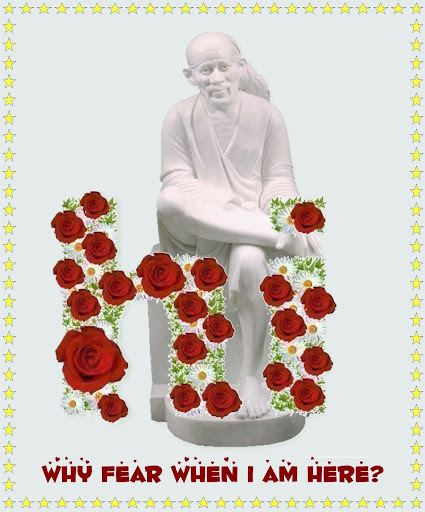 chants his name continually will be sure of being blessed with the ability to be adept in all his actions. What does a snake around Ganesha’s stomach represent? Ganesh Chaturthi or Ganesha’s Birthday comes on the 4th day of Bhadarva Shukla-Paksh of Hindu calendar in (August/September). Milk is offered to idols of Lord Ganesh at home and at temples, and worshippers visit Ganesh temples for Ganesh Puja. Ganesha’s vehicle is the Mooshak. Lord Ganesh is very fond of modak. On one of His birthday’s Mata Parvati, cooked for him twenty-one types of delicious food and a lot of of modak. Ganesha ate so much that even his big belly could not contain it. Then he set out moving on his mouse at night. Suddenly the mouse stumbled as it had seen a snake and became frightened with the result of that Ganesha fell down. The symbology behind the mouse and snake and Ganesha’s big belly and its relationship to the moon on his birthday is highly philosophic. The whole cosmos is known to be the belly of Ganesha (hence, his other name is Mahodara) .Parvati or Shakti is the primordial energy. 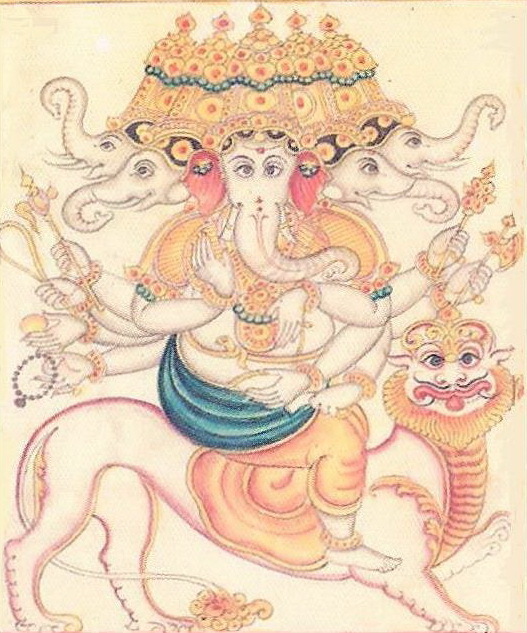 The seven realms above, seven realms below and seven oceans, are inside the cosmic belly of Ganesha, held together by the cosmic energy (kundalini ) symbolized as a huge snake which Ganesha ties around Him. The mouse is nothing but our ego. Ganesha, using the mouse as a vehicle, exemplifies the need to control our ego. One who has controlled the ego has Ganesha consciousness or God-consciousness. Why is Ganesha called the remover of obstacles (Vighneshwara)? Ganesha is known as Vigneshwara because his devotees believes Ganesha roots out obstacles and difficulties from their lives and ensure success. “Eshwara’” is the embodiment of all riches – physical beauty and strength, knowledge, wisdom, material wealth, spiritual enlightenment. “Vighna” translates as an unforeseen obstacle or impediment. Abhinandan, king started a Yagya in order to fulfill his goal of becoming the Indra ( or King of Heaven). When the news of the yagya spread, Lord Brahma tried to block King Abhinandan’s overweening ambition of ruling the heavens and decided to create obstacles in the his path. He summoned Kalapurush and asked him to destroy the Yagya. After killing Abhinandan and destroying the yagya Kalapurush acquired the name Vighnasura, the creator of obstacles. But Vighnasura, ran amok himself and and destroyed all Vedic practices on earth. He could be thwarted by none, except Ganesha who in those days was at the ashram of Sage Parashar. Gajanan took birth as Parshwaputra and Deepvatsala son and fought valiantly with Vighnasura, who had to except defeat. He abdicated himself to the Lord and asked to be blessed. Ganesha spared Vighnasura’s life, on the condition that the demon would not appear in any place where Ganesha was worshipped. 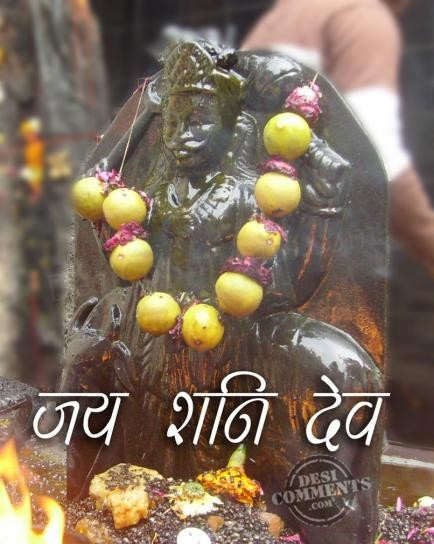 Before disappearing, the demon extracted a promise from Ganesha, that he incorporates his name with that of the Lord. 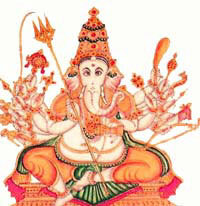 Thus, Ganesha acquired the name Vighneswara or “Destroyer of Obstacles”. Legend also has it that the very same Devtas installed an image of Vigneshwara at Ozar on Ganesh Chaturti and offered worship. This God of knowledge and the remover of obstacles is also the older son of Lord Shiva. 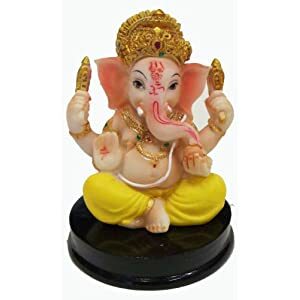 Lord Ganesha is also called Vinayak (knowledgeable) or Vighneshwer (god to remove obstacles). He is worshipped, or at least remembered, in the beginning of any auspicious performance for blessings and auspiciousness. He has four hands, elephant’s head and a big belly. His vehicle is a tiny mouse. In his hands he carries a rope (to carry devotees to the truth), an axe (to cut devotees’ attachments), and a sweet dessert ball -laddoo- (to reward devotees for spiritual activity). His fourth hand’s palm is always extended to bless people. A unique combination of his elephant-like head and a quick moving tiny mouse vehicle represents tremendous wisdom, intelligence, and presence of mind. Bala Ganapati is "the Childlike" God of golden hue. 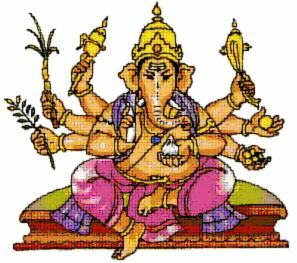 In His hands He holds a banana, mango, sugar cane and jackfruit, all representing the earth's abundance and fertility. His trunk garners His favorite sweet, the modaka. Why the shani bhagwan did not ''catch'' Ganesa and Anjaneya ? The worship of Lord Hanuman is a panacea for the harsh effects of the 'unfavourable' presence of Lord Shani. In the Ramayana, Lord Hanuman is said to have rescued Shani from the clutches of Ravana and in gratitude, Shani promised Hanuman that anyone who prayed to Him (Hanuman), especially on Saturdays, would be rescued from the "malefic" effects of Saturn, or at the very least, the effects would be softened. Another version of the encounter between Lord Hanuman and Shani Bhagavan is that once Shani climbed on to Hanuman's shoulder, implying that Shani's influence was beginning on Lord Hanuman. At this, Hanuman assumed a large size, and Shani was caught painfully between Hanuman's shoulders and the ceiling of the room they were in. As the pain was unbearable, Lord Shani requested Lord Hanuman to release him, promising in return, that if a person prayed to Lord Hanuman, he (Shani) would moderate or eliminate the malefic effects of his influence on that person; following this, Lord Hanuman released Shani. Bhagwan Ganesha the first God, who destroys the evil and doing good may be reasons. Why is Lord Ganesha's Vehicle the Mouse ? 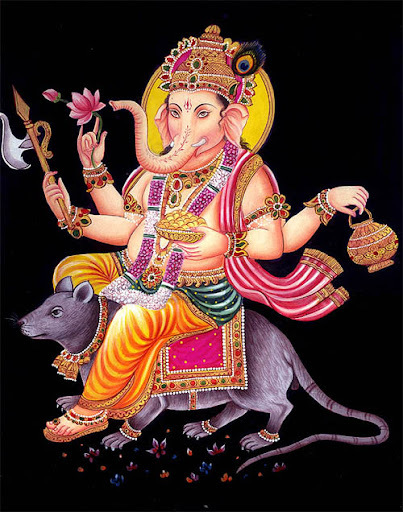 In The mouse is the vehicle of Vinayaka. What is the inner significance of the mouse? The mouse is considered as the embodiment of the sense of smell. The mouse is a symbol of the attachment to worldly tendencies (vaasanas). It is well known that if you want to catch a mouse, you place a strong-smelling edible inside the mouse-trap. The mouse also symbolizes the darkness of night. The mouse can see well in the dark. As Vinayaka's vehicle the mouse signifies an object that leads man from darkness to light. The Vinayaka-principle, thus, means that which removes all the bad qualities, bad practices and bad thoughts in men and inculcates good qualities, good conduct and good thoughts. " 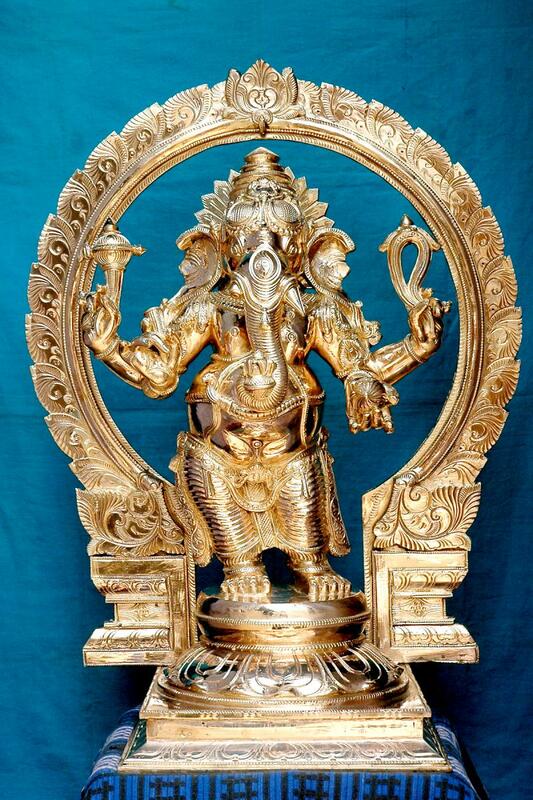 Lord Ganesha is thought to have been derived from an animistic deity, possibly a Dravidian sun god. Lord Ganesha is a propitious god, promising success, prosperity, and peace and is invoked before any sort of enterprise. It is his responsibility to decide between success and failure, to remove obstacles or create them as necessary. His pot-belly symbolizes a pitcher full of prosperity, a sort of abdominal cornucopia. Lord Ganesha has many names. Ganesha's earliest name was Ekadanta (Having One Tusk), referring to his single whole tusk, the other having been broken off. The main ones are Ganapati (Lord of the tribe or attendants), Vighnesvara (controller of all obstacles), Gajanana (elephant-faced), Gajadhipati (Lord of elephants), Lambkarn (long-eared), Lambodar (pendant-bellied) and Vinayaka (the prominent leader). A description of all of the characteristics and attributes of Ganesha can be found in the Ganapati Upanishad (an Upanishad dedicated to Ganesha) of the Rishi Atharva, in which Ganesha is identified with Brahman and the Atman. In this search for a historical origin for Gaņeśa, some have suggested precise locations outside the Brāhmaṇic tradition.... These historical locations are intriguing to be sure, but the fact remains that they are all speculations, variations on the Dravidian hypothesis, which argues that anything not attested to in the Vedic and Indo-European sources must have come into Brāhmaṇic religion from the Dravidian or aboriginal populations of India as part of the process that produced Hinduism out of the interactions of the Aryan and non-Aryan populations. There is no independent evidence for an elephant cult or a totem; nor is there any archaeological data pointing to a tradition prior to what we can already see in place in the Purāṇic literature and the iconography of Gaņeśa. Thapan's book on the development of Ganesha devotes a chapter to speculations about the role elephants had in early India but concludes that, "although by the second century CE the elephant-headed yakṣa form exists it cannot be presumed to represent Gaṇapati-Vināyaka. There is no evidence of a deity by this name having an elephant or elephant-headed form at this early stage. Gaṇapati-Vināyaka had yet to make his debut." Ashtavinayaka or eight Ganeshas is located in Maharashtra state of India, The Ashtavinayaka yatra or pilgrimage covers the eight holy temples of Ganesha .All the Eight Ashtavinayak Templs are Swayambhu (self-originated) and Jagrut.There are various names of Lord Ganesh for various places. The various names of Lord Ganesh are Moreshwar, Mahaganpati, Chintamani, Girijatmak, Vighneshwar, Siddhivinayak, Ballaleshwar and Varad Vinayak . These Temples are situated at Morgaon, Ranjangaon, Theur, Lenyadri, Ojhar, Siddhatek, Pali and Mahad. These places are at Pune, Ahamadnagar and Raigad district. Of the 8 vinayakas, 6 are in Pune district area and 2 in Raigad district but still comparatively nearer to the Pune areas. Ashtavinayaka or eight Ganeshas is located in Maharashtra state of India, The Ashtavinayaka yatra or pilgrimage tour covers the eight holy temples of Ganesha which are situated around Pune. Among the Ashtavinayakas, Ballaleshvara at Pali is the only Ganesha who is famous by the name of his devotee and who is dressed up as a brahmin. Village Pali is situated between fort Sarasgad & river Amba flowing on the other side. On being pleased by devotion of Ballal, Shri Ganesh remained in the stone worshipped by Ballal & hence is called as Ballaleshwar of Pali. Village Pali is situated in the Sudhagad taluka in the district of Raigad. This place is nestled between the fort Sarasgad and River Amba. The nearest railway station is Karjat, which is 30Kms away. Ashtavinayaka or eight Ganeshas is located in Maharashtra state of India, The Ashtavinayaka yatra or pilgrimage tour covers the eight holy temples of Ganesha which are situated around Pune. At Theyoor in the Haveli Taluka of Pune district in Maharashtra is the Ashtavinayak temple dedicated to Chintamani Vinayak. The village is along the river Mulamutha. Lord Ganesha as Chintamani is god who brings peace of mind and drives away all perplexities of the mind. Page created in 0.485 seconds with 69 queries.